#2Laces - Loop, Swoop and Heal! My brother was diagnosed with Glioblastoma Multiform, a terrible kind of brain cancer. Throughout treatment he's maintained his eccentric personality often wearing mismatched shoes. #2laces is social campaign encouraging people to mismatch their shoe laces to help build awareness and raise money towards GBM research. When my brother first began having trouble focusing and understanding emails, we naively chalked it up to distraction. He was a workaholic, but otherwise incredibly healthy. Then, in June of 2016, he was in LA attending a wedding when we received a strange call from him. He was incoherent, out of sorts. I contacted the hotel who called the paramedics, and within a few hours, I was on the phone with a doctor at the Cedars-Sinai ER who was telling me that my brother could die that night. We flew out on the earliest red-eye. My brother survived, but we were hit with the painful news that he had been diagnosed with Glioblastoma Multiform, or GBM. GBM is the worst and most common kind of brain cancer. It is responsible for the deaths of Senator John McCain, former Vice-President Biden’s son Beau Biden, and Senator Ted Kennedy, to name a few. GBM can alter a person’s personality, memory, and ability to talk or walk. The treatment is challenging, physically and emotionally. The radiation causes the brain to swell, and the steroids used to keep the swelling down cause hallucinations, anxiety, personality changes, anger, and more. Treatment effectiveness is measured in months, not years. Even when the disease is “fully removed” it almost always returns. My brother is fortunate to have survived 28 months since his diagnosis, including 12 months where he lived an otherwise normal life. Now he is re-battling this disease in a different part of his brain. 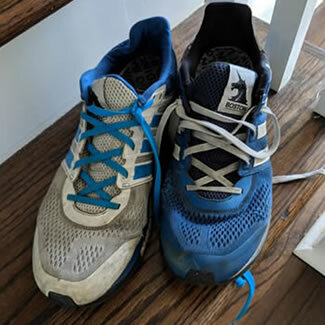 I recently re-laced some shoes with two different color laces to decide which I liked more. 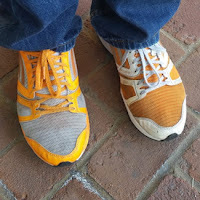 The mismatched laces received a lot of attention and kept reminding me of my brother. This was the start of #2Laces. The goal of #2Laces is to raise awareness about GBM and encourage donations for GBM research so that we can find better treatments with better outcomes. It's also about celebrating the uniqueness of each person, in spite of their battle. This disease takes away so much from a person, but it is not what defines them. 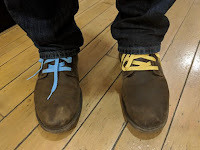 Whether it's your mismatched laces, shoes, socks, or just your own unique style: Take a picture of your uniqueness, share on Facebook, Twitter, Instagram and challenge your friends to do the same, and include the hashtag #2Laces! 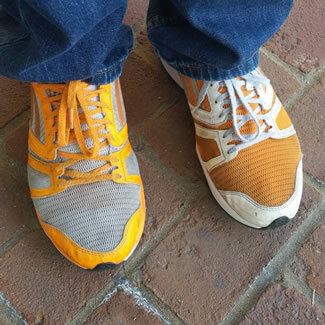 Take a picture of your mismatched laces, shoes, socks, or just your unique style. Share a picture with hashtag #2Laces, and challenge your friends to do the same. Spread the word about 2Laces.org!